I’d like to join my co-organizer, Jean-François Blanchette, in welcoming all of you, and in thanking the many people and institutions who have made this event possible. First and foremost, we thank our primary funder, the Institute of Museum and Library Services’ Laura Bush 21st Century Librarian Program, and express our particular appreciation to program officers Emily Reynolds and Trevor Owens for their support throughout the application process, as well as to IS PhD student Stacy Wood, who provided essential assistance in researching and drafting our original grant proposal. A number of people who wrote in support of the grant are also here today as participants, and we welcome them with thanks: Jason R. Baron, Howard Besser, Jan Garvin, Karen Gracy, Cal Lee, Yvonne Ng, Shira Peltzman, and Linda Tadic. Other supporters who have contributed to making this working meeting more comfortable and more fun—and therefore far more productive!—include Dean Jennifer Mnookin and the UCLA School of Law, who generously sponsored our Taco Tuesday social hour and opening night reception; Sharon Farb and the UCLA Library for use of their well-appointed meeting spaces; our colleagues in the Department of Information Studies, particularly our Chair Jonathan Furner, and the Wasserman Dean of the Graduate School of Education and Information Studies, Marcelo Suarez-Orozco. And now, to the topic at hand: audiovisual recordings and record-keeping. Imagine for a moment that we are not in California, but in Dallas, Texas, where a crowd is forming. They have come as spectators and supporters, to be part of something memorable, even historic; at a time when racial tensions are peaking nationwide, it is important for these people to be here together on this day. Thousands of them line the downtown streets. Then, without warning, a sniper fires his weapon from above; chaos, confusion, anger, and grief quickly follow. Federal, state and local law enforcement reach out immediately, along with the media, to those who witness the event in an effort to establish just what happened and why. Not everything goes as it should; a Dallas policeman dies trying to apprehend the shooter. Paper insert accompanying Texas home movies processed in late November, 1963; image courtesy of Austin History Center. I am talking here not about events that occurred six weeks ago—in July of 2016—but fifty-three years ago, in November of 1963. Then, as now, people captured the events of the day on camera—the moments before and after shots are fired, the times when citizens encounter the state in violent and lethal ways. People created records that became evidence, evidence that became history. The challenges we are here to discuss this week are not new, but venerable. Among those challenges are material and mechanical ones: What are the critical affordances of our recording technologies, their capabilities and limitations? What falls beyond the frame; what gets redacted or corrupted? Four frames of the original Zapruder film were, famously, damaged by LIFE magazine photo technicians during copying. Two other frames appeared out of sequence in the original printed version of the Warren Commission Report. In every frame of the 8mm original, there is exposed image area between the sprockets—which, as can be seen here in frame 371, captures important information about the scene as it unfolded, but which is not visible during regular projection. In a climate of suspicion and distrust, any missing, hidden, or altered data quickly becomes fodder for conspiracy theories. It is impossible to restore integrity to a broken chain of custody, or authenticity to an altered original. LIFE Magazine spread, November 20, 1963; © TIME, Inc.
Other challenges are informational and access-related: What right do the people and the press have to see and circulate images of significant events? What ethical guidelines govern the use of these images in news, in entertainment, in the social sphere? 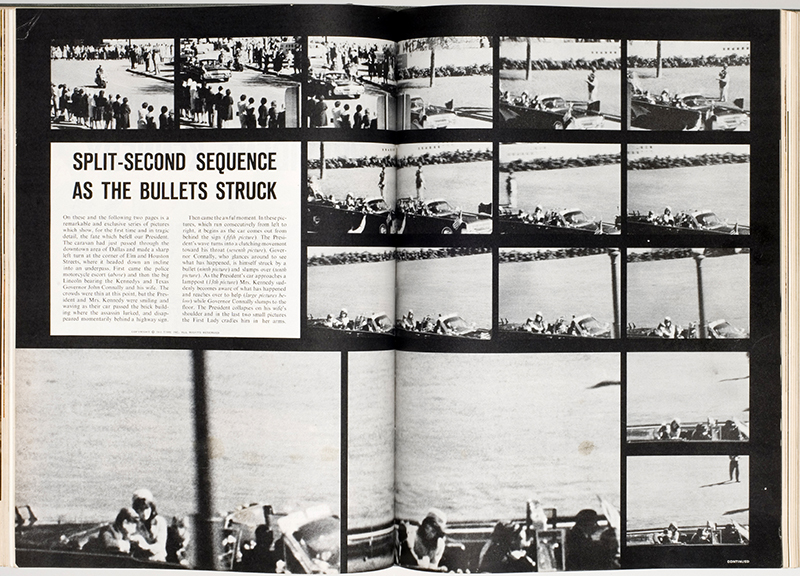 Zapruder sold first-publication rights to his film to LIFE for a hefty sum, but stipulated that frame 313, which showed the moment of the bullet’s impact, should not appear in print when the magazine ran its feature on the assassination the week of November 29. Originally printed in black and white, the images were reproduced in color in a special “JFK memorial edition” one week later, and in three more issues that followed over the next two years, creating multiple versions of the sequence to haunt the visual imagination of the public. 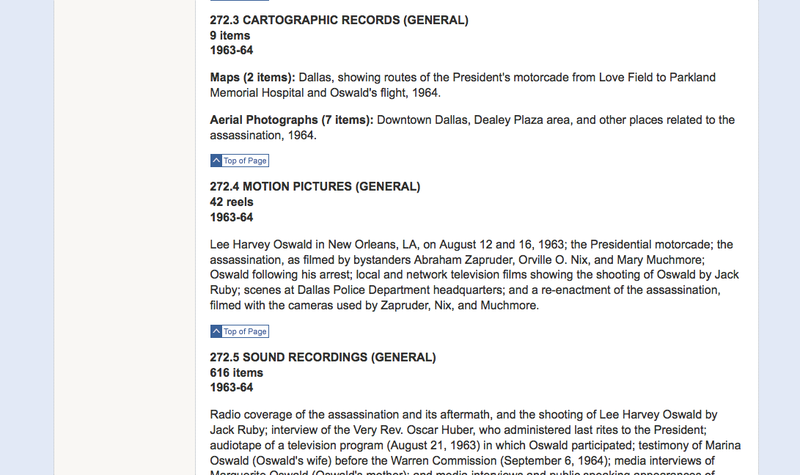 LIFE’s registration of the published images for copyright protection in 1967 led to multiple civil lawsuits, and to long-running debates over the applicability of fair use doctrine and ownership of the original film—not to mention widespread public dismay over the airing of the assassination images on broadcast television in 1975. We continue to struggle now with discussions of what images we may see and what images we might not want to see—and with the morality of sharing those images, or profiting from violent death as spectacle. Finally, these records pose custodial and curatorial challenges: Who takes responsibility for the preservation of these recordings? What happens to their material forms and social meaning over time? How do the acts of classification and designation dictate these records’ disposition, and what kinds of value do we ascribe to them? 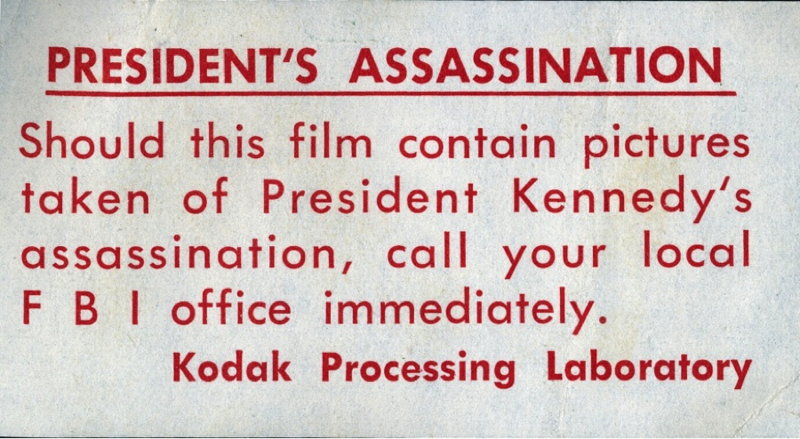 The U.S. government effectively asserted eminent domain over the original Zapruder film, designating it an “assassination record” under the 1992 John F. Kennedy Records Collection Act. 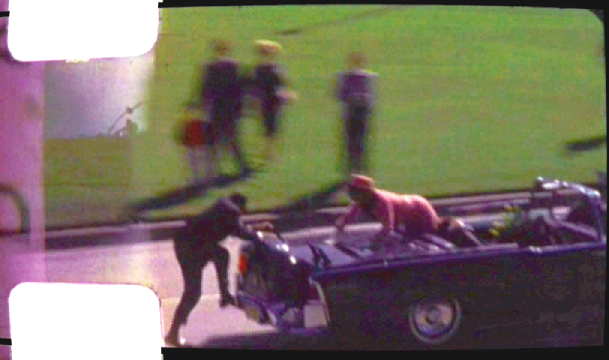 In the case of the Zapruder film and its contemporaries, the original materials are stored by archives and museums—but what about the records we are all generating today of the stories that dominate our headlines? How do we secure their survival for the next fifty-three years? Records retention policies and the legal “duty to preserve” extend only to what we must keep; they do little to address what we should keep, or how to move beyond basic compliance and toward responsible stewardship. What’s more, the widening gap of trust between our communities—especially communities of color—and those empowered by the social contract to wield force in the cause of keeping the peace has made it difficult to find common ground. Whatever echoes there may be between the past and the present, 2016 is not 1963. We are now working in a media and technology environment that is incredibly swift-moving, and unprecedentedly powerful. This is a hard time for having conversations about the long term. It is a hard time to take on complex problems for which solutions may be a long time coming. It is a hard time to be making and collecting records that are written with invisible electrons in machine languages that will be forgotten by next year. It can be difficult, as well, to confront the succession of news events and the lengthening list of names of the fallen that are connected to these issues, and that continually redefine the boundaries of this topic. I am therefore humbled and heartened at the fact that so many people, representing so many different interests, have come here to do just that. Three days of meetings and talking—with travel on either side of it, for most of you—is a big ask for working people, whatever field you do your work in. But like me, I think you are grateful for this chance to ask questions of one another, share what you know with each other, and focus on what we might do together to address these very timely, very old concerns. Thank you for coming, and thank you for the work you came here to do.